It’s time to start getting creative and find fun Father’s Day Crafts for toddlers to make. I’ve made it easy for you by throwing together a couple of my favorite homemade gifts for Father’s Day. These Father’s Day crafts for toddlers all come together pretty easily with big results. Even better, most of these supplies you probably already have, bonus! Let the (somewhat!) messy art making begin, it’s going to be fun. The most important part is these gifts is they come right from your child and are sure to melt Dad’s heart. Check out my ideas below! 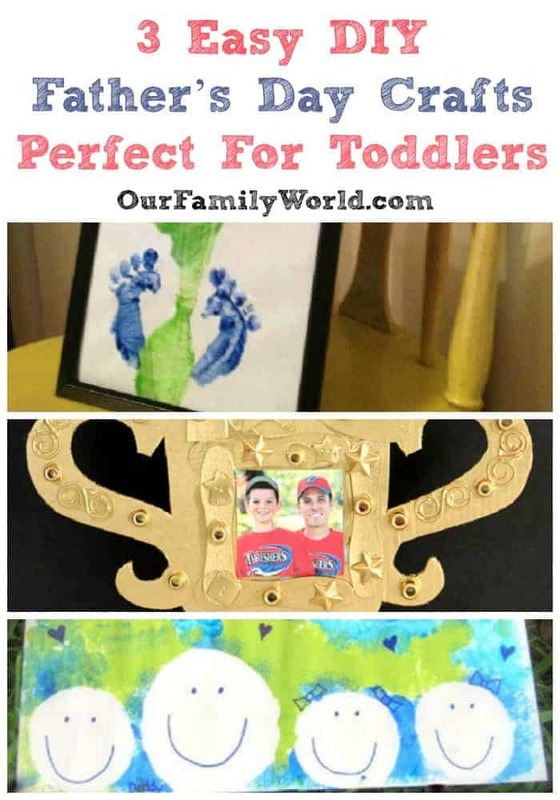 So will you make any of these Father’s Day crafts for toddlers with your favorite little? What do you have planned for your favorite Dad for Father’s Day? I want to hear in the comments! Handprint and footprint crafts are so personal as gifts. As my kid gets bigger, I love looking back on how small her hands and feet once were. 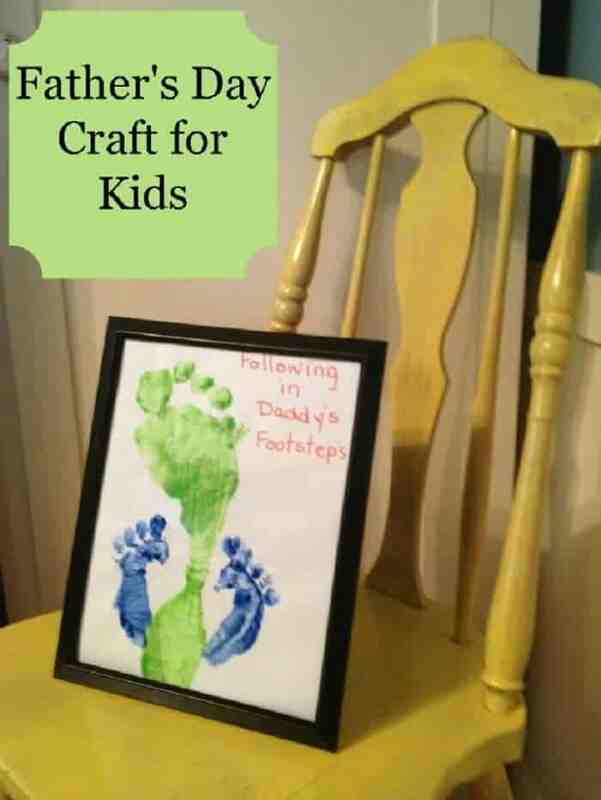 Try this adorable following in Daddy’s Footprint Craft. Your favorite Dad’s face will light up when he sees his footprint next to his child’s. If you want to keep this idea a surprise from dad, you can paint the bottom of one of his old shoes to make a print, then add your kid’s footprint to the project. Some of the best projects my child and I have made together have been when we were creative and painted, usually on big paper! 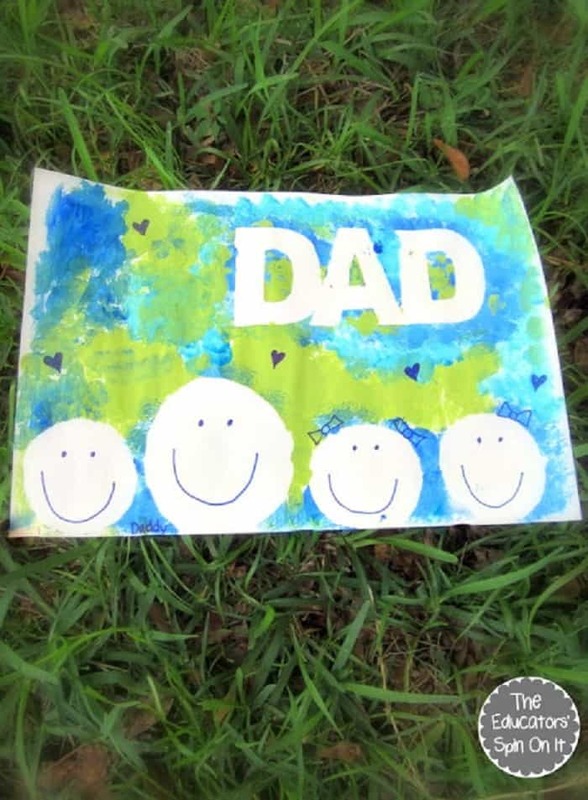 Check out this fun Father’s Day painting project! Start by laying down circles for each of your family members, and the outline of the word Dad. Then let your kid get creative and paint! This project doesn’t need any special supplies. As long as you have paint and paper, you should be able to recreate it. Even better, this project is a great Father’s Day craft for kids of multiple ages to make together. Fun! 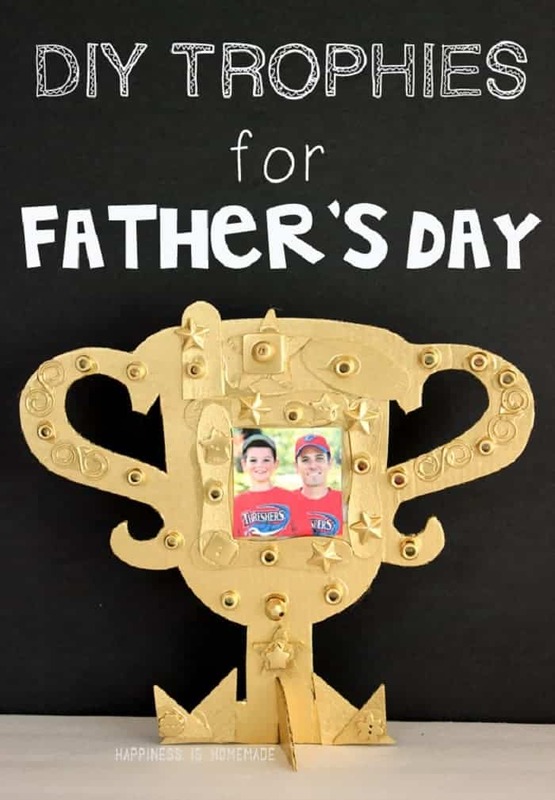 I love the idea of making this DIY Trophy For Dad for Father’s Day! This cute craft is also the perfect opportunity to use some of those loose ends in your craft bin. I know you have half used bags of foam stars and colored beads just like I do! I love Father’s Day crafts I can make from items I already have. Start by cutting out the shape of a trophy out of cardboard. Then let your toddler go crazy gluing an assortment of dried pasta, foam stickers, beads, or anything other interesting shaped babbles you happen to have. (If you’re out, hit up the dollar store!) Make sure to leave enough room in the center for a cute picture. Then spray paint the entire project gold, and glue on your picture. Instant trophy, I love it! I make this with my kiddo for Dad this year. Shhh, don’t tell him ok? I think the foot prints craft is such a lovely idea and I wouldn’t mind doing that myself. I love the footprint art. We just made ladybugs here with our feet dipped in paint. These crafts would keep my grand kids busy and they’d love to make them. I’ll have to let them make something for their dads for Father’s Day. Nice idea, I am going to try this with my son and this would be a perfect Father’s day gift to all the best fathers in the world! These are such cute ideas. I love the trophy one the best. My daughter can’t wait to try one of these. All of these are so cute. I really like the footprints one. I need to make some of those with my girls so they can give them to their dad. I’m sure he’d love it too. Cute ideas, I love having tiny footprints to look back at. The trophy idea is pretty impressive! Awww such sweet memories, I loved the DIY crafts and cards y children used to bring home from school for any occassion Fathers day inclusive. Thanks for bringing them back to me! So sweet. I loved the ideas you showed. I definitely want to do this with my littles for fathers day. These are so simple, yet unique ideas. father’s day and mother’s day both are important for me and all of us. Such ideas provide a lot of encouragement to kids. Nice ideas, I would love to received one of these on Father’s day! Hope my son gonna do some DIY crafts for me. The DIY trophy is a sure win for any kind of dad, nice gold coloring on the sample!. I just love these ideas for any occasion. It is hard to believe that Father’s Day is upon us once again. My how time flies! These are some great ideas, by the way. I’m sure fathers will love any of these gifts! They’re amazing ideas and very doable when you have toddlers or babies at home. What an awesome way to show fathers that you love them! I love the footprint craft. How cute! The trophy picture frame would be a wonderful gift too. Homemade gifts are the best. It’s nice to look back at them years down the road and remember when your kids were small. I needed an idea for Father’s Day! These are great ideas! We might steal an idea or two. These are all awesome ideas! I am going to have to try one of these.